In addition to the suspension of the rights to use the shared amenities in a condo or HOA community for association members who fail to pay their monetary obligations, the legislature has also enabled the associations in the state to suspend the voting rights of delinquent unit owners. However, unlike with the suspension of the rights to use the pool or the fitness center, there are some potential drawbacks for some associations with the suspension of voting rights that require careful consideration. HOAs and condominium associations are both able to suspend the voting rights for owners who become delinquent in the payment of monetary obligations exceeding 90 days. These suspensions are automatically lifted upon the full payment of all monetary obligations currently due and overdue by the member. HOAs are also able to suspend both the voting rights and the use rights of the common elements in the community for noncompliance with the governing documents. As with the issuing of fines, some of these collections remedies require advance written notice and a hearing opportunity for the unit owner. However, with a suspension of voting rights for being delinquent, the law does not require a notice or a hearing. Associations only need to adopt a collection policy which includes the suspension of voting rights as a remedy, and this new policy should be communicated in writing and at a general membership meeting. 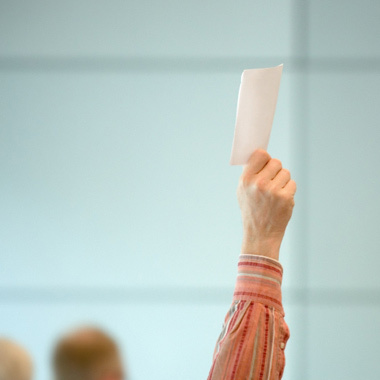 A typical association policy for the suspension of voting rights establishes that the board of directors will take a vote at a meeting of the board to initiate the suspension of a delinquent member’s voting rights. Unfortunately, the use of this remedy against delinquent members has the potential to backfire for some associations that may rely on the votes of their large numbers of delinquent owners on a regular basis. Voting suspensions serve to reduce the pool of potential voters on any issues that require membership votes, and there is a section of the statute (720.305 for HOAs and 718.303 for condos) that implies that the number of owners who would be needed to constitute a quorum is reduced by the number of units with suspended voting rights. However, there remains some debate as to whether that was the true intent of the revision to this statute by the legislature, and this uncertainty creates the potential for votes to be challenged by recalcitrant members on the grounds of whether they achieved the required number of voters to fulfill the quorum. Due to these issues, the most prudent policy for associations which depend on the voting by delinquent members in order to carry forth their votes on a regular basis would be to avoid the suspension of voting rights. Suspending the voting rights of nonpaying members is just one of the remedies that the associations can use to spur these unit owners to bring their accounts current. The condominium associations and HOAs in the state should carefully consider and utilize this and all of the other collections measures that the law allows. Our community association attorneys represent more than 500 condominium associations and HOAs throughout South Florida, and we will continue to monitor and write about important issues impacting the associations in this blog. We encourage association members, directors and property managers to submit their e-mail address in the subscription box on the right in order to automatically receive all of our future articles.